So in 2015 Harley decided to change the Dyna FatBob dash. It is nearly the same width as before but the bottom is cut so that the tank bib is similar to the narrow Softail Slim bib and leaves me with a smidge of leather to tool. After working with a new client in Australia that picked up one of these new Dynas, there is now a wide version of the bib. Designed by myself, it uses the exact same bolt locations as the factory bib but is as wide as the dash. Here is Alex’s bib sporting the Chaos Pebble “Split Lane” with his unit patch front and center. After learning last month that the 2013 Harley Road King has an option for a one piece dash and making a tank bib that didn’t work for that application I worked it out with the client to create a new design and revisit his artwork with a splash of color. After a couple of sessions of working on it, here is the result. The design fits around the ignition switch and runs down the dash to bolt to the lower tank bolt under the seat. 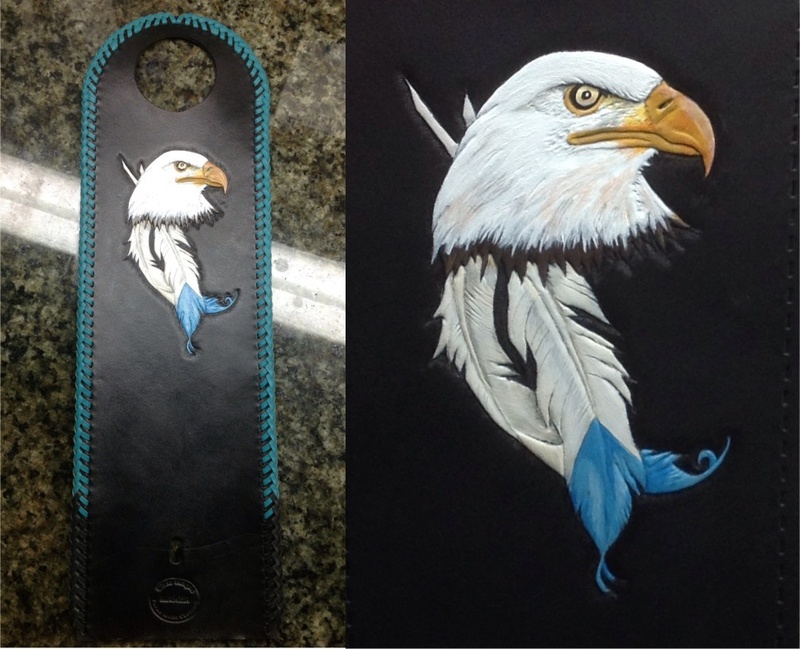 The custom eagle and warrior feathers artwork was hand tooled and painted and the edges were hand braided with turquoise kangaroo leather lacing imported from Australia. Had a couple of new and cool custom leather Harley fender bibs and a tank bib roll out of the shop this week and it got a little crazy with color around here. I added a new example to the Suzuki Boulevard C90T Boss custom fender bibs, this one was engraved on the new laser and then finished and laced by hand. The Frankenstein bib was made for a 2013 Harley StreetGlide and the Blackhawk fender bib and Senior Aviators tank bib is for a 2003 Softail Heritage. All three were hand tooled and hand painted with Citadel and Vallejo acrylics.